Father Eddie Cullen ( a relative of my father's) was a chaplain with an Irish Regiment in France. Our family had a long, detailed letter written by him from the Front telling of his battle experiences. I put this away for safe keeping some years ago, and now I can't remember where it is! Hopefully it will turn up one day. 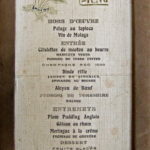 However we still have a menu for Christmas Dinner 1915, from 'Somewhere In France', an artillery shell (decorated in Egyptian-type drawings) and a wall mount featuring a small artillery shell and some bullet casings. Father Cullen must have had a traumatic time, but at least he was able to enjoy a sumptuous Christmas Dinner in 1915. Christmas Menu (for Officers) from 'Somewhere In France', 1915 Artillery shell decorated with Egyptian-type drawings. 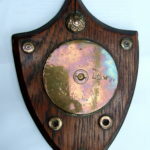 Wall plaque featuring shell and bullet casings.